Pre-registrations have to be adressed to the Waldhort at any time. 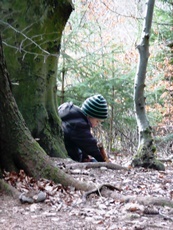 „The young person needs an equal – namely animals, actually elements: water, mud, shrubbery, space to play. You may let him grow up without all this, e.g. with stuffed animals, on carpets and bituminized streets and yards. He will survive, but don’t be surprised, when he will not perform on some basic social achievements." Children need stable links to affectionate humans but also links to nature and its elements like crop, soil, water, stones, trees, meadows and animals. Children adopt the world by dealing with their territorial and social environment. They get to know their natural environment with all their senses. They see, smell, taste, hear and hear. The conjunction of these inputs and the interpretation are mandatory steps of their personal development. In a world of permanent stimulus satiation nature and forest enables school children for catchy experience. Just here they can explore and understand fundamental processes of life like growth, change, transience and continuity. In addition they see nature as living and deserving protection. A lot of educational targets can be communicated without any artificial stimulus as an environment with trees, shrubs, meadows and animals offers a lot of inspirations and therefore a natural filed of experience and learning for school children. Forestal pedagogic leads to a positive and emotional relationship with nature. The everyday life in the after school club emphasizes the global, regional and local context and interdependences.